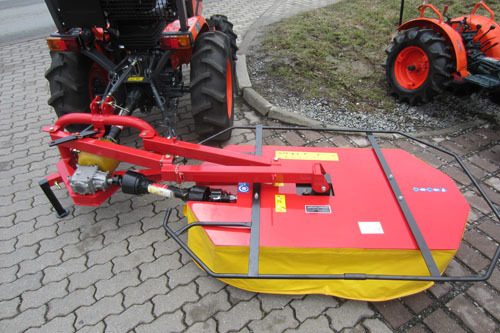 Main page » Small tractors and implements » Implements » Rotary mower HK135S-LA 1,35m low boom high performance lawn mower deck mower 2 articulated shafts incl. 1.250,00 EUR 19 % VAT incl. The mower is designed with a simple parallelogram slewing. During transport to the mowing job the mower deck should be pivoted to just behind the tractor and locked with the flat iron holder. During the mowing job the mower deck should be pivoted to the side and locked with the flat iron holder again. 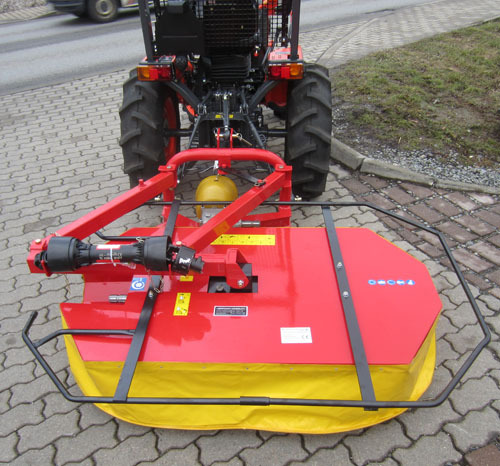 This rotary mowers are manufactured since 20 years by Italian manufacturer and sold throughout Europe. This rotary mower is especially suitable for small and twisty areas, because it is compact and manoeuvrable. We sell these devices since 1997 in the wholesale and retail trade and have had only good experiences. 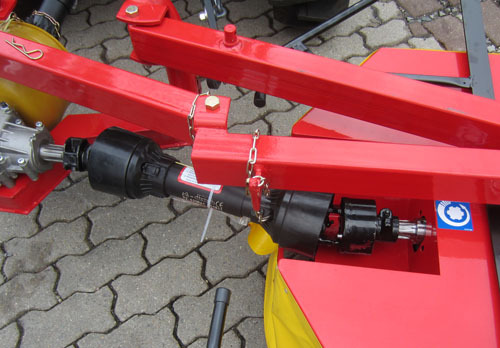 The tractor should have a rear three-point hitch KATI and a standard PTO 1 3/8 540rpm clockwise. 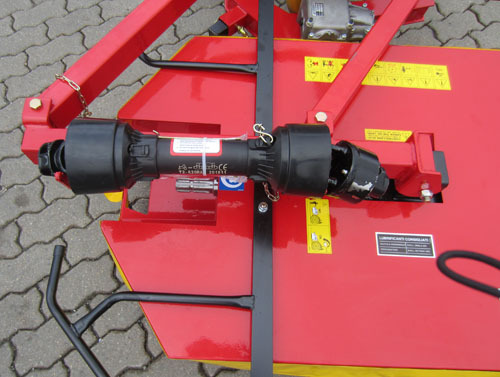 The PTO shaft with freewheel from the transmission to mower is included as standard in the package. 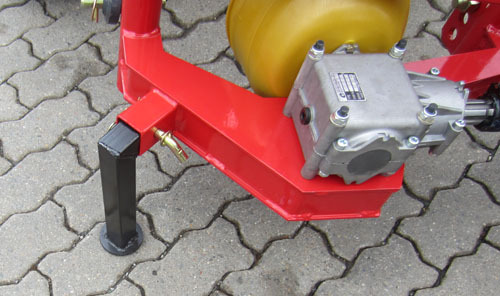 The PTO shaft from the tractor to the the mower deck is included. 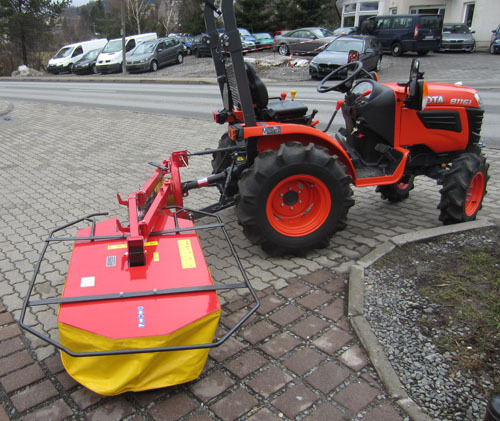 These mowers are designed especially for small tractors. A freewheel is already built into the transmission or the PTO, depending on edition. 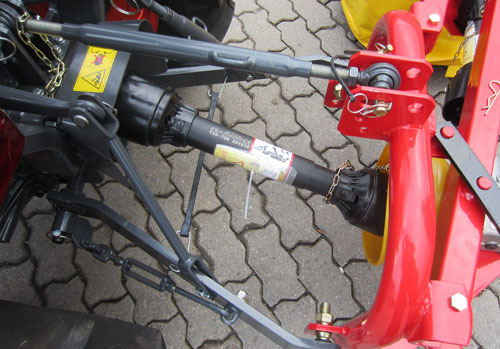 This means that if you turn off the mower deck the mower drums can taper off rotation by the freewheel without rotation of the PTO shaft or the gear is damaged. 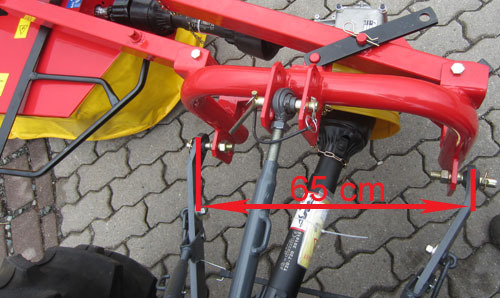 No matter how small your tractor is - when you use the 1st mowing gear and a small group, then you can use the mower deck even with a grass height of 1 meter. But for that your tractor should move with step speed. Here you can see the mower in the transport position. The propeller shaft is mounted on the holder.